Pigs have been domesticated since ancient times approximately 5,000 to 7,000 years ago. Pigs are mammals and originated from Eurasian Wild boars. The largest pig ever recorded was a Poland-China hog, named ‘Big Bill’. Owned by Burford Butler of Jackson Tennessee in 1933, this huge pig weighed 2,552 lbs and had a height of 5 and a length of 9 feet. His stomach was so long it dragged on the ground. Pigs originally lived in woodland and foraged for seeds, fruits, flowers, grasses, nuts, roots and grubs. Pigs use their snouts, a very sensitive organ, to dig into the ground. Pig, also called hog or swine, is a generic term for all pigs regardless of gender or breed. There are approximately 2 billion pigs world wide. A male pig is called a boar, before she has piglets a female pig is called a gilt after which she is referred to as a sow. The largest litter of pigs on record was 37! However the average litter is 12 piglets. Pigs skin's, if he or she is healthy, should be shiny, free from loose dead skin, scabs or wrinkles and to a greater or lesser degree depending upon breed covered with course hairs. Pigs are social animals and make friends not only amongst their own kind but other species as well. It may surprise you to know that a pig may be more intelligent than your dog and ranks forth intelligence wise behind chimpanzees, dolphins and elephants. Contrary to popular belief pigs are clean creatures. Pigs defecate away from their living areas. Piglets will leave the nest to relieve themselves when they are only a few hours old! Sows build nests out of grass and other foliage before farrowing, (giving birth) the need to do this is so strong that in the environment of the modern factory farm pigs become frustrated when they are unable to do so. Pigs are weaned after three months but they continue to live with their mother. After only two weeks pigs learn their names and will respond when called. Pigs do not perspire, to keep cool they wallow in mud which also keeps them clean and free from pests and other irritations. As the wet mud falls off it cleanses the pig. Pigs are susceptible to sun burn. A layer of dried mud helps to protect them from the sun. Pigs have a such keen sense of smell that they can easily find things underground. Pigs are good swimmers and if it is available prefer water to mud. Pigs used to be kept on board ships because it was believed if that if they were shipwrecked the pigs would always swim toward the nearest shore. Pigs are very inquisitive creatures, and like human babies they investigate with their mouths, anything unusual. Pigs live on average about fifteen years, have an acute sense of smell and becasue their eyes are placed on both sides of their head they have a wide field of vision. Pigs have at times both straight and curly tails, it is said that when their tails are curly that they are happy. Pigs are omnivorous, this means that in the wild they eat both meat and plants. Like all domesticated animals pigs have religious significance. In ancient Egypt pigs where associated with Set ,originally the god of the desert, Storms, Darkness, and Chaos. In Egypt Sows where symbols of fertility as in the imagery of the sky goddess Nut sucking her many piglets, the stars. In both Catholicism and Eastern Orthodoxy pigs are associated with St Anthony the Great the patron St of swineherds who was born in Egypt in 251, and who spread the idea of monasticism. In Hinduism the god Vishnu took the form of a boar in order to save the Earth from a demon who had dragged it to the bottom of the sea. In Judaism the eating of pig is considered non kosher and is forbidden as the pig is considered an unclean animal. The eating of pork is also forbidden in Islam and also by some Christian sects, the seventh-day-Adventists amongst them. According to Christian tradition Jesus drove demons out of a possessed man and into a herd of swine which afterwards stampeded over a cliff. Depictions of the Buddhist wheel of life show the pig as one of three animals( pig, snake and crow) binding mankind to sensual desires. Each animal is symbolic representing a particular human failing, Known as the three poisons. which are considered an hindrance to enlightenment or spiritual progress. The pig is identified with ignorance based upon the pigs habit of keeping his head low to the ground with his large ears falling over his eyes thus symbolising a blinkered vision giving rise to a perspective narrowed by our cultural conditioning whereby we lose sight of our own essential, natural being. Melrose Abbey in Roxburgh Scotland, founded as a Cistercian monastery in 1136 features an unusual gargoyle, a pig with bagpipes round his neck on the South wall of the nave. Pigs feature extensively in art from the ancient earliest known picture of a pig, which is believed to have been painted 40,000 years ago in a cave in Altamira in Spain, to sculptures of pigs painted in 21st century bath. 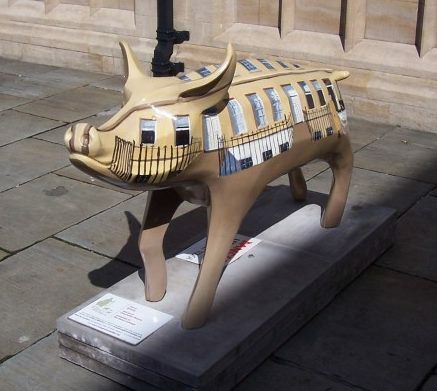 The picture below is one of a hundred decorated pig sculptures exhibited around bath and in neighbouring areas during the summer of 2008 to celebrate Bath's origins and its artists whilst providing both residents and visitors with a unique artistic attraction. Exhibit of pig sculpture outside Bath Abbey, one of a hundred sculptures included in the King Bladud’s Pigs in exhibition held in the city of Bath during the summer of 2008. There is an interesting legend connecting pigs to the founding of the city of Bath. Bladud, the mythical King of the Britons and father of King Lear contracted leprosy whist studying in Athens. He returned to England, and after realising he was not able to inherit the throne he left the royal palace and became a swineherd in an untravelled part of the country. This area was the Avon valley, here Bladud crossed the river Avon as he drove his pigs in search of acorns. The legend has it that the pigs also contracted leprosy but were cured after rolling in mud which arose from Bath's springs. Witnessing the healing of his pigs Bladud bathed in the murky water and he likewise was cured, after which he returned home and was restored to his position as heir apparent to his father, eventually becoming king in 863 BC. ​Bladud founded a city at Bath so that others may benefit as he had done and in gratitude for his miraculous healing, dedicated its curative properties to the Celtic goddess Sul. The above is a page from a medieval book of hours, Très Riches Heures du Duc de Berry or Très Riches Heures , by the Limbourg Brothers 1416, it is considered as probably the most important illuminated manuscript of the 15th century. 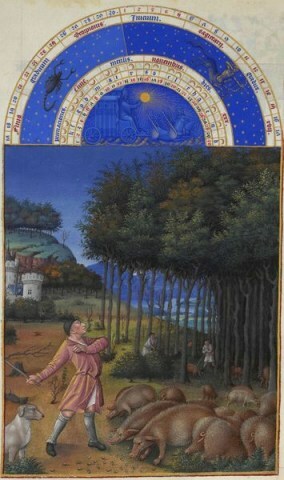 The picture, November ,depicts swine being driven into the forest for the pannage season. Pannage is a term for releasing domestic pigs into woods or forests so that they may feed on acorns or beech mast. This practice is no longer carried out generally but is still observed in some areas such as the New Forest in southern England. Notice the swine are small and prick eared with a long bristly body which was typical of the medieval pig which resembled more its ancestor the wild boar than the modern pig. 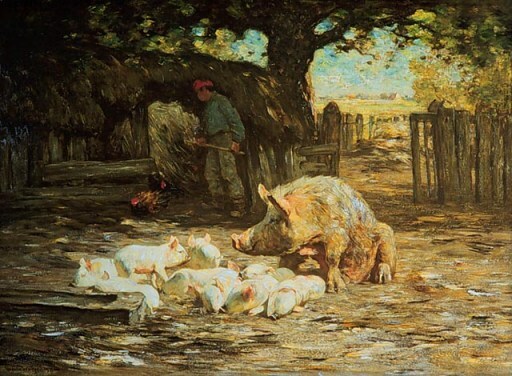 Horatio Walker was a successful Canadian artist, mostly working in oils or water colours, he often depicted rural scenes such as the painting above entitled Little While Pigs and Mother. This delightful painting rendered in oils on canvas now hangs in the National Gallery of Canada. The pig is one of the 12-year cycle of animals which appear in the Chinese zodiac related to the Chinese calendar. Chinese astrology associates each animal with a number of personality traits, people born in the year of the pig are said to be: honest, patient, over sensitive, modest, shy, supportive, trustworthy, lovers of nature, vulnerable, greedy, materialistic, quick-tempered. 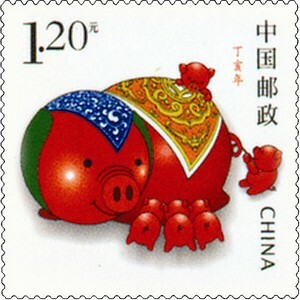 The most recent year of the pig was 2007 commencing February 18th.The pig in the Chinese tradition is a representative of good fortune and luck. Since ancient times the year of the pig is considered to be an auspicious time to be born, those born in the year of the pig are said to be very lucky and will be happy and honest. Prospective Chinese parents plan to have their child born in the year of the pig. The pig is associated with fertility and virility in Chinese culture. 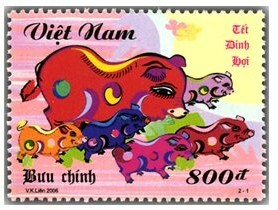 Numerous Stamps have been issued featuring pigs, here are two examples to celebrate the Chinese year of the pig. I am not an animal expert of any kind just your average person who loves animals, all animals, and feels deeply about the plight of many of our fellow creatures. Neither am I a writer, or any other expert. Therefore please keep in mind that the information included in this website has been researched to the best of my ability and any misinformation is quite by accident but of course possible.